The Bachelor of Engineering - Mechanical Systems Engineering program (MSE) is accredited by the Canadian Engineering Accreditation Board (CEAB) allowing students to start on the path to becoming a professional engineer. It is geared to motivated individuals looking for challenging careers in the dynamic and growing areas of mechanical design, robotics, and advanced manufacturing. The MSE program is an innovative and challenging one, delivered using project-based curriculum. As students undertake four years of increasingly complex real-world projects, they will progress from engineering fundamentals to advanced, leading-edge technologies in design, manufacturing and automation. Students also develop proficiency in business, project management, environmental and sustainable design as well as interpersonal and team dynamics. In addition, liberal studies breadth courses and generic skills complement the engineering curriculum. Graduate attributes ensure that a graduating engineering student is technically prepared with the knowledge and skills required to work as a professional engineer. They also ensure that graduates are prepared for the professional responsibilities required of an engineer, and that they are employable. Students in the MSE program are regularly required to demonstrate these attributes in the series of projects they complete each semester. As part of the continual improvement process, feedback is regularly gathered from MSE program stakeholders, including students. This feedback is reviewed at the end of each semester and academic year to ensure both student success and academic and operational quality. As documented in the rest of this Program Handbook, both Conestoga and the MSE program have numerous policies, procedures and support services in place. Students are made aware of these during Orientation activities. Engineering curriculum is required to ensure a foundation in mathematics and natural science, a broad preparation in engineering science and design, and an exposure to non-technical complementary studies. The quality and balance of a program is assessed using a tally of Accreditation Units (AUs) as defined by CEAB. The MSE program is designed to ensure students receive more than the minimum curriculum components required for accreditation. Students can apply to enter level 1 on the basis of their high-school marks. Students with a suitable three-year technology diploma, for which a pathway to MSE has been established, may apply to bridge into MSE; acceptance into the bridging process is based on a case-by-case analysis of each applicant's background and final interview with the MSE bridging panel. After successful completion of a set of bridging courses, students can enter MSE at an advanced level, either at the second or third year level. To find out more about the bridge entry to MSE, see the MSE program webpage under "About The Program." Students who have partially completed a CEAB accredited engineering program at another institution may apply to enter MSE with advanced standing. Acceptance into an advanced level is based on a case-by-case analysis of each applicant's background by the program coordinator in consultation with other MSE faculty. Program Outcomes are located on the Mechanical Systems Engineering program page on the left side navigation bar. Academic promotion decisions are made by the program Promotion Committee. The Promotion Committee is composed of the program coordinator and all of the faculty team members for that particular semester. It meets at the conclusion of every semester, and at the call of the program coordinator. The MSE program is a cohort-delivered program. A cohort is the group of students who begin level 1 of the program together. The cohort is identified by the year in which students enter level 1. Each cohort has a program design assigned to it. Since changes are made to program designs, different cohorts can be following a different MSE program design. An example would be that if MSE is started in 2015, the cohort is identified as 1501 and follows the 1501 program design. If MSE is started in 2017, the cohort is 1701 and follows the 1701 program design. Although the 1501 and 1701 designs will be largely the same there may be different courses, course hours etc. in each design. It normally takes a cohort four years to complete the MSE program but if it takes a student longer than four years, the student will change cohorts and therefore change program designs. Students actively registered in cohort delivered programs who take longer than the designed program length of time to complete their studies are accountable for completing any new or additional courses that may result due to changes in the program of study. Promotion from one semester to the next requires a program grade point average (GPA) of 2.5 and two (2) or fewer un-cleared failures from that semester and all previous semesters. Students who are promoted but have un-cleared failures may not be able to take courses for which the failed course is a prerequisite. A grade of 60% (2.0 grade points) is considered the minimum level of achievement for passing a course, however, students must maintain a minimum program GPA of 2.5 (65%) to avoid probation, repeating the same level or discontinuance. This means that achieving 60% in a few courses will be okay however many courses with final marks of 60% will result in an overall GPA less than 2.5. A student can be placed on probation for reasons stated in section 4.3. A student can be discontinued from the program for reasons stated in section 4.4. Normally there will be no academic decision made at the end of semester one, except as mentioned in section 4.4. The official promotion policy can be found on the college website (see Baccalaureate Degree Promotion and Graduation Policy). Graduation from the program requires a cumulative GPA of 2.5 and completion of all courses and modules including the three (3) required Co-op semesters. Students who have entered MSE either via bridging or advanced standing must also complete three (3) Co-op semesters. Depending on the advanced entry level, it may be necessary for students to complete Co-op term(s) after completion of year 4, unless an exemption is granted based on previous suitable work experience acquired through previous Co-op work terms from the graduated program or regular employment. The evaluation is based on relevancy with the program requirements. To obtain exemptions from Co-op terms, students must apply for credit transfer with the college Credit Transfer Office. 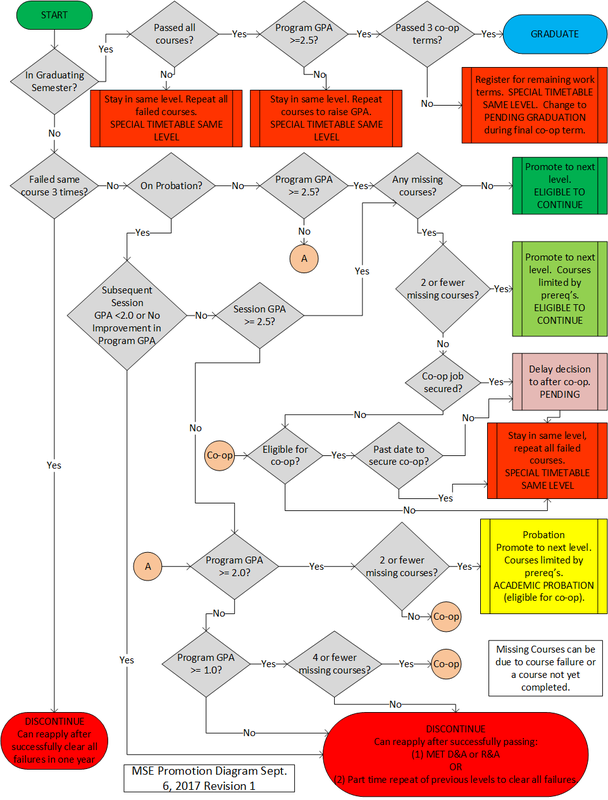 A flow chart showing how MSE promotional decisions are made is shown below. Bridging students' acceptance into the MSE program is conditional on successful completion of the assigned bridging course module with an overall bridging GPA of 2.5 over a period of no more than 1.33 years. For students on a four-month bridge, courses failed during the bridging module need to be re-taken during the next academic year and this will extend the bridging period to 1.33 years. In the event that not all bridging courses are passed during the extended 1.33 year bridge, students with an overall bridging GPA of at least 2.0 may reapply for one more four month bridging term during the fall term of the next academic year. These students will receive credit for any past bridging courses for which a final mark of 65% was achieved and will need to repeat all other courses. At the end of the additional four month term, students will be assessed for eligibility to enter MSE based on successfully completing all bridging courses and achieving an overall bridging GPA of at least 2.5. If at the end of the additional four month term the candidate has still not met the requirements, no further opportunities will be available to bridge into MSE. In all cases, bridging course credits older than 2.33 years will not be considered. Complete supplemental work (Learning Contract or Supplemental Exam) for course/module failures (see criteria for writing of supplement examinations). Repeat the course/module at the earliest opportunity (student may be placed on probation). Repeat the entire level (students will be on probation and will not be allowed to take any courses from advanced levels). Discontinuance from the program with a possibility of re-entry. Discontinuance from the program with no possibility of re-entry. Students may be allowed entry into a course for which they are missing a prerequisite only with the permission of the program coordinator and with the approval in writing of the course Professor. In addition to prerequisites and corequisites, it may not be possible to take courses out of sequence to preserve the links between courses and curriculum projects in any level. The student has passed the theory portion of the course. The student has not previously had a supplemental in the course. The form of the supplemental will be determined by the course professor and will either be an examination, an assignment or a combination of the two. If the supplemental is not an examination, a learning contract must be established. Decisions regarding supplemental eligibility will be made at the marks and promotion meeting by the promotion committee, after which time students will be informed of their eligibility by the professor using college email. Students must fill out a Supplemental Authorization form available from the Program Coordinator and register for the supplemental at the Registrar's office (there is a fee associated with this) prior to the start of any supplemental work. If a student successfully passes a previously failed course through either a supplemental examination or a learning contract, the previously awarded grade for the course will be changed to 60%. If a student repeats a course or module, the grade earned on the repeated course will be recorded and used to calculate the program cumulative average and Grade Point. A student who has contacted the faculty member and determined that he/she is ineligible for a supplemental or a student who has failed a supplemental must repeat the course at the earliest possible time. The student must contact the Program Coordinator with the details of the course in order to obtain a Special Timetable. Timetabling conflicts due to students taking courses in multiple years is often unavoidable. Students should note that a single failure often results in an additional year to complete the degree. Students repeating courses must repeat all evaluations in the course. A decision of 'special timetable same level' will result from conditions shown in the MSE promotion diagram. Students will need to clear any failures or dropped or missing courses before being promoted to the next level. This will add one more year for the program completion. A student with a program GPA between 2.0 and 2.5 and two (2) or fewer failures will be placed on academic probation. Failures must be cleared and the student's GPA must be raised in order to return to normal academic status. Students on academic probation are eligible to continue in the program with academic conditions as defined by the prerequisite and corequisites of the program and to apply for co-op placements as long as they meet the academic requirements specified in section 5.7. A student on probation will be discontinued if their session GPA in any subsequent academic term is below 2.0 and if they have not made reasonable progress in passing courses and clearing failures within one calendar year. Students will be taken off probation once their program GPA is at least 2.5 and they have cleared all failed courses. There is no progress in clearing failed courses and maintaining a 2.5 GPA while on probation. They are carrying more than four (4) core subject failures. They have a GPA that is below 1.0 (Average below 50%). They have had 3 academic offences and/or a student code of conduct violation necessitating discontinuance. Normally there will be no academic decision made at the end of level one. However, a student may ne discontinued at the end of level one based on a unanimous recommendation of the program's Academic Promotion Committee. 1. Readmission will not be granted sooner than one year after the discontinuance decision. Successful completion of two full-time semesters (minimum of five courses per semester) in one of Conestoga College's engineering technology diploma programs (Design and Analysis or Robotics and Automation) with a minimum average of 80% in EACH semester and with no final grade less than 65% in individual courses. It is the applicant's responsibility to identify appropriate engineering technology programs if not attending one of the above mentioned Conestoga College programs. Re-take all courses within the level preceding the discontinuance decision. If the discontinuance was solely the result of failing the same course three (3) times than all failed courses must be cleared within a year. 3. All readmitted students will be on academic probation for one year after their readmission. Performance will be assessed under the probation requirements. 4. Students are permitted only one readmission into the program. Students are eligible to graduate upon completion of all academic requirements in their program of study, including three co-op work terms. Students are expected to respond to their invitation through their Student Portal. Convocation ceremonies are held in the spring and fall of each academic year. Students, who take longer than the advertised program length, are responsible for completing any new or additional courses due to a program design change. Students who complete their program after the scheduled completion date are required to fill out an Application to Graduate form and submit it with payment to the registrar's office. Students who are discontinued or have withdrawn and then return to the college will be placed in the current program design and must meet all requirements to graduate. For students beginning MSE in level 1, the program must be completed within seven (7) years of its start. Students who enter the program by bridging or advanced standing must complete the program in the normal time required to complete the remaining levels plus one year. Leaves of absence or exceptions must be approved by the Program Coordinator and Program Chair. Academic assistance is available to students through a variety of avenues. The Program Coordinator can advise students on specific program and course information such as adding/dropping courses, special timetabling, etc. Access the Conestoga website for assistance provided through Accessibility Services. Access the Learning Commons website for detailed information on the academic services they provide, including Learning Skills, Peer Services, Math and Writing assistance. Program start and end dates, holidays and deadlines for course add/drop, withdrawal and refunds are located on the website. Course changes (add/dropping) may also be made through the Student Portal under the "My Courses" tab. Electronic devices may be used for learning or instructional purposes. Professors or technologists may request devices be put away when a safety issue or distraction occurs. Devices used for accommodations are always welcome. Unauthorized devices in a testing situation will result in an academic offence and at minimum, a mark of zero. Course outcomes need to encompass at least 80% of the MSE course for which the exemption is sought and be taught at a degree level. Care will also be taken to ensure that the institution/program in which the course was taught has engineering accreditation. As the MSE program is accredited by the CEAB, we must also follow the requirements for credit transfer found in the CEAB document Accreditation Criteria and Procedures Report 2016. Note that in MSE the project-based nature of the program may require students to continue a course regardless of courses taken from previous institutions. Exemptions are not granted for courses completed more than seven years previously. The maximum credit allowed through Transfer of Credits is 50% of the program credits. Therefore, at least 50% of the program credits must be taken under the direct supervision of Conestoga College faculty. Laptops MSE is a laptop program. The students are required to purchase their laptop with specified minimum hardware configuration. The laptop must be equipped with anti-virus software. The College will provide access to engineering software as required by each course. Students are required to purchase an electric kit in Year 1 that will be used in labs/projects in several courses during their studies. Students are expected to purchase the textbooks required by each course. It is the student's responsibility to have a laptop available when it is required in class, during evaluations etc. Electronic Kit Students are required to purchase an electric kit in Year 1 that will be used in labs/projects in several courses during their studies. The cost of the electronic kit is paid at the bookstore and the kit is then obtained from the program technologist. The course professor will provide more information on how to obtain the kit. Sign-Outs There will be times when students sign out equipment, parts or resources. Each student is responsible for anything signed out and is expected to return the item in a timely manner in its original condition. Deposits may be required. Students will be required to pay replacement value for parts that they have signed out but not returned. Books Each year students are required to purchase a number of text books. Students are expected to purchase the textbooks required by each course. The faculty team has made every effort to selects texts that will help students learn the concepts required to success in the program. Assigned reading lists are provided for many classes. Most of these readings will be from the specified text books. Each student is responsible for completing this reading before class. Students are required to submit all assignments on or before the time and date specified. Students should anticipate problems that might necessitate an extension of time. If an extension of time is required, students will make this request to the appropriate professor well in advance of the due date (24 hour minimum). Approval of the request is at the discretion of the professor. Refer to the Attendance at Evaluations section in this handbook. Each project has a clearly defined set of dates for its deliverables. If, for a legitimate reason, any student believes that that their project cannot be completed on time, they must formally request an extension to the due date from the project coordinating professor at least one (1) week prior to the scheduled end of the project. Approval of the request for extension will be considered by the faculty team, but is not automatic. Work submitted by a student must be the product of his/her effort. Claiming the work of others as one's own constitutes plagiarism. Plagiarism, cheating and other forms of academic dishonesty will not be tolerated. Please refer to the Academic Offences Policy and Procedure listed here on the website. Work is normally due one week from the date assigned. Any exceptions will be clearly stated. Students are responsible for keeping a copy of all submitted and marked assignments. All project work is evaluated using a set of predefined rubrics. Depending on the specific outcomes for the week, student performance will be evaluated and recorded. Each student will receive a copy of this marked rubric identifying specific areas of strength and/or weakness. These rubrics should be kept as of a record of performance. There is no extra credit assignments allowed in the MSE program. Quiz/exam rules are set by the course professor prior to the exam. In the case where a student wishes to dispute an interim mark (assignment, lab, midterm exam, etc.) the student must first see the professor to discuss the issue. In cases where a satisfactory outcome cannot be achieved the program Chair should be consulted. If a grade is re-evaluated students will receive the most recent grade for the work. The re-evaluated grade could be the same, higher or lower than the initial grade. In the MSE program, you are required to complete two (2) Interdisciplinary Electives. These courses are chosen by the student in the academic term indicated by the program design. These elective course requirements are listed at the bottom of each student's progress report, which is found on the Student Portal. The progress report indicates the level/semester and the minimum hours that are required for the program. Students are responsible for adding the Interdisciplinary Elective course into their schedule during the designated semester. Eligible courses are approved and posted each semester on the college website. Visit Current Students | Conestoga College and click on 'Announcements'. For additional information regarding Interdisciplinary Elective courses, please contact the School of Liberal Studies. It is recommended that students keep coursework until the end of the semester in the case of any discrepancy in the grades. As part of the College's quality initiative, the MSE program is required to maintain academic evidence showing the achievement and progression of students through the program. Within the first few weeks of the program all students are required to sign an Authorization to Retain and Use Student Material form. Project rooms must be kept locked at all times unless a faculty member requires the doors to be open for a brief period. Otherwise the room doors are not to be blocked open so that there is a controlled entry. After-hours rules must be followed. Project rooms must be kept tidy and free of clutter. Students must use the lockers in the hall and cubbies provided to store personal and academic items. It is the student's responsibility to lock up any valuable items. Desk-top computers within the room are not intended for students' daily use; they are there because they have specialized software required for some labs/projects. Please do not use these computers unless you are directed to do so by a faculty member. Students may be required by faculty to turn off computers, including personal laptops, during lectures and other exercises. Students must comply with the faculty request. Students should avoid causing disruption during lectures. Cell phones should be muted. Students should use washroom facilities during breaks between classes. The project rooms are to be considered a place of business. There is to be no game playing, movie watching, loud music, inappropriate surfing of the internet, horseplay or other unprofessional behaviour in the project rooms. No unauthorized furniture or appliances are permitted in the project rooms. Theft, tampering, loss and/or destruction of college equipment are not permitted and will result in a student code of conduct violation and possible criminal charges. Please respect others and the property of others. The project rooms may have video surveillance. Students are expected to practice safe working habits at all times while in the machine shop. Failure to follow the rules that result in injury to yourself or others will result in disciplinary measures. Faculty/technologist supervision is required at all times. Machines may only be used under college supervision. Long neck or wrist chains must be removed while operating machinery. Through ways are marked with wide yellow lines; nothing is to be placed within the marked areas. The machine power knife switch located just beside each machine must be turned off before making any adjustments to a machine. Never reach into a machine for a part. Never leave a machine until it has come to a full and complete stop. Machines with computers or electronic control assistance are particularly dangerous in that they may appear to have or be stopped but in fact may start up again unexpectedly. Know where the red emergency palm buttons are located on every machine; activate the emergency button if an accident warrants its use. Do not lift objects that weigh in excess of 30 lbs/13 kilos; a lifting apparatus is available for heavier objects. Electrical/electronic equipment/devices must be properly shut off when not being used, such as solder machine, power supply, etc. Protective safety devices shall not be removed from any of the equipment. Machine set-ups are to be checked by faculty to verify safety. Note: If you have any special needs that may affect you safely working machinery, you must notify your instructor prior to entering your first class. Refer to your Student Guide for Conestoga's Safety and Security services and procedures. Other rules may be set by supervisory faculty/staff in shops and labs. Hearing protection is mandatory in designated areas. Safety glasses/eye protection must be worn when operating mechanical/electrical tools, such as jigsaw, handsaw, file, drill, etc. Foot protection must be worn in designated areas-- No sandals or open-toed shoes are permitted in the work area. Steel-toed safety shoes must be worn when heavy objects are to be lifted. Loose clothing is not allowed. Tuck in shirts and pull up pants. Long pants must be worn when working in the lab.